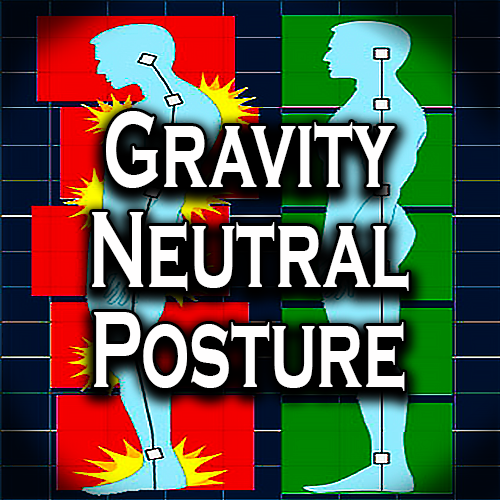 When you have a gravity neutral posture your body is relaxed and not under any undue pressure. The Body in a Resting State or gravity neutral posture is relaxed and the spinal column is not stressed. The gravity neutral posture will permit you to stand or work for extended periods with minimal fatigue. Head erect, and chin slightly tucked in. Shoulders must be relaxed. Pelvis will be allowed to tilt a little forward; this pulls in the gut in and lets the knees adjust forward a little so they are not locked. Arms will be hanging loosely. If you are running, your arms will automatically draw themselves up to look like chicken wings. That is good. The central nervous system does things like that. Watch the basketball players. 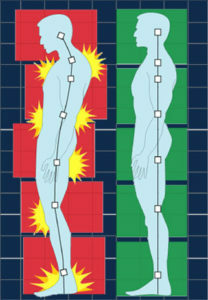 In a gravity neutral stance our major muscles are relaxed and we are using no conscious effort to keep a good posture. This works as we run or perform our routine tasks. The body is straight and not dragged out of balance by the weight of the head, thorax and pelvis. The country blacksmiths’ bench was at knuckle height. That kept his body in line with gravity you too should help nature by keeping your spine in line. Also, work at a desk with a user friendly position with wrists supported. That way it causes no undue tension in the body. When working at a task in front of you, like baking a cake or working with a wrench, place one foot on a stool. Otherwise the body will adjust to gravity by causing you a big belly. When we are exercising, like in body building, practicing aerobics or running, our central nervous system will balance the body into “gravity-neutral” all by itself. We just need to relax and not waste energy with co-contraction of opposing muscles. As a matter of fact, we should feel free and loose, or floating with an easy feeling of minimal exertion. We are only using the amount of muscular effort required to propel ourselves. Furthermore, our arms are swinging gently back and forth like chicken-wings. We do this just enough to keep the body balanced as the shoulders, legs, hips and head gracefully move the distance that is necessary for them to keep their momentum. One great offender of posture is bad shoe designs. Also, I like to be barefoot or at least have comfortable shoes with minimal rise from ball to heel. Go as natural as you can. The coach of the basketball player, Larry Bird, said “He was the most relaxed player that I ever saw.” We each should go through life as a relaxed player.